Not to be confused with Gold Ore or Gold Bars. 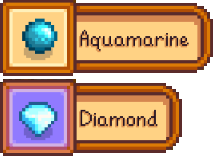 Gold is the primary currency of Stardew Valley. The amount of gold a player has is displayed at the top right of the screen, directly below the time. All players start with 500g. "Total Earnings" and "Current Funds" can be viewed at any time on the Inventory screen of the pause menu. All shops, other than those that are part of the Stardew Valley Fair and the Casino, will accept Gold as payment for their goods. The primary method of earning gold is to collect items by farming, fishing, foraging, mining, or engaging in combat, then selling the items by placing them in the shipping box on the farm. Gold is earned after the player goes to sleep for the night, and the amounts for each item are displayed on a summary screen. Alternatively, items can be sold to various merchants throughout Stardew Valley, and gold can be collected immediately. Each merchant will purchase only specific items that correspond to the type of items they sell: Pierre's General Store buys edibles, the Fish Shop buys Fish, the Blacksmith buys metal ores and gems, etc. The player may also complete quests to earn gold. Quests are either posted on the "Help Wanted" board outside of Pierre's General Store, or delivered directly to the player's mailbox on the farm. Quests involve acquiring/delivering items, slaying monsters, or catching fish. Upon completion of a quest, the player may earn gold by opening the Journal, selecting the completed quest, and clicking on the reward icon. The player will also receive gold in the mail. The player's mother or father will send money after the player earns specific amounts of gold, Pierre will randomly send 'Cash-back Rewards Program' rebates, and Lewis will randomly send gold from the 'Stardew Valley Agricultural Fund' for being a member of the community. There are 5 Achievements directly related to earning gold. Whenever an item whose sell price is greater than 500g is taken into inventory, the popup box on the lower left of the screen will be shaded purple. There are 8 digits available to display current funds on the display at the upper right of the screen. If the player accumulates 100,000,000g or more in current funds, the display will "roll over" and subtract 100,000,001g from the total shown. The full amount of gold is still available for the player to spend, however. It is our pleasure to inform you that your farm will be featured in next week's "up & coming" column of the Stardew Valley Tribune! Congratulations. We're impressed with your quick progress. This page was last modified on 24 November 2018, at 18:16.